When Michael Jr., a Content Marketing World keynote presenter, took the stage, he admitted, “This is not my audience at all.” While this may sound like an inauspicious beginning, within a few minutes, there was a palpable shift in the room as the audience truly focused its attention – and turned off devices – to hear what he had to say next. 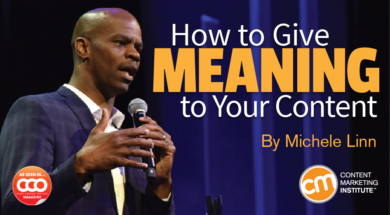 One of the key messages from Michael Jr.’s act is a simple statement: “When you understand your ‘why,’ your ‘what’ has more purpose.” By that he means, when you understand why you’re telling a particular story or – even more elemental – why your business exists, then your story or message can be on note. We all need to hear – really hear – this message, but there was something even deeper about Michael Jr.’s connection with the audience – and something I couldn’t put my finger on until the follow-up conversation. I was expecting to spend an enjoyable 30 minutes chatting with Michael Jr., but I didn’t expect the degree to which he would change the way I think about marketing … and how I interact with people in general. What’s behind this comedian who understands that comedy is more than funny? How did he make the transformation from traditional comedian to someone who inspires people – especially people he doesn’t consider to be his audience – to act? Over the course of an hour at Content Marketing World, Michael Jr. shared how a transformational moment fundamentally changed the way he communicates with his audience – and there is much for marketers to learn. “I was going to get on stage, and right before I got on, I had a shift in my understanding. Every comedian in Los Angeles, every comedian I know … we’re all about getting laughs out of people. And I just had this shift, this epiphany, where instead of going to get laughs, I just decided, why don’t I just give them an opportunity to laugh? Michael Jr. went on to explain how this works in his stand-up career. For example, he’s just as likely to offer stand-up comedy at a prison or a hospital these days as he is in front of a paying crowd. And no matter the audience, he makes a point of hearing stories from those attending – and finding a way to tease comedy from ordinary interactions. In fact, he has a gift for pulling laughs from beautifully awkward moments with the people in his audience – individuals willing to share private details in front of massive crowds based almost entirely on the spirit of giving Michael Jr. brings to his shows. Beyond simply giving laughs, Michael Jr. also believes we all have important gifts to share. He says his own gift is the ability to make people laugh while asking them to examine the deeper meaning of their lives. His comedy, he explains, pushes people to open up to him in ways that are hard to imagine. Whether it’s the widow who sought him backstage to say she laughed for the first time in months or a man who tearfully approached him after a show to explain he was a fugitive of the law, hiding out at his aunt’s house, and had decided to turn himself in. “If we sat there for two hours, and I didn’t deposit anything that could help you get any further, what is the point of that? If I make 7 million people laugh next year, and nobody was better as a result of it, then I need to go fill out an application somewhere,” he shares. “The greatest gift you can give someone is the opportunity to give,” says Michael Jr.
You may not think you have these opportunities, but they abound. Michael Jr. challenges each of us to answer this question: If you didn’t need to make any money, but you wanted to help your customer, what would you give them? I have found myself coming back to this question time and time again since my conversation with Michael Jr.
What is your gift that you can give? If you’re taken with the idea of giving more and taking less, consider these examples of brands creating memorable, giving experiences. The Nerdery is a one-stop shop for nerd-needed mobile and web applications, websites, systems integrations, and digital-project consulting. Recruiting top nerds is an ongoing challenge in an economy lacking in digital talent … and the Nerdery is consistently named a top employer. One project that defines its workplace culture: The Overnight Website Challenge. Volunteers form teams of web designers, developers, and writers to crank out websites for needy nonprofits in 24 hours. Bombas sells socks … what is so special about that? Before the company launched, it learned that socks are the No. 1 clothing item requested at homeless shelters. To help, Bombas donates one pair of socks for every pair purchased – and not just any type of sock, but socks designed specifically to withstand the rigors of living outdoors.